If you look closely at the image set captured on 8 August, you might notice that images 7-9 are corrupted and images 10-12 are missing completely. Nothing to worry about - VMC is performing perfectly! What you're seeing is, in fact, the affect our own planet can have on our exploration of Mars! These images were sent back from Mars early in the afternoon of 10 August and received via ESA's 35m deep space station in Cebreros, near Madrid. 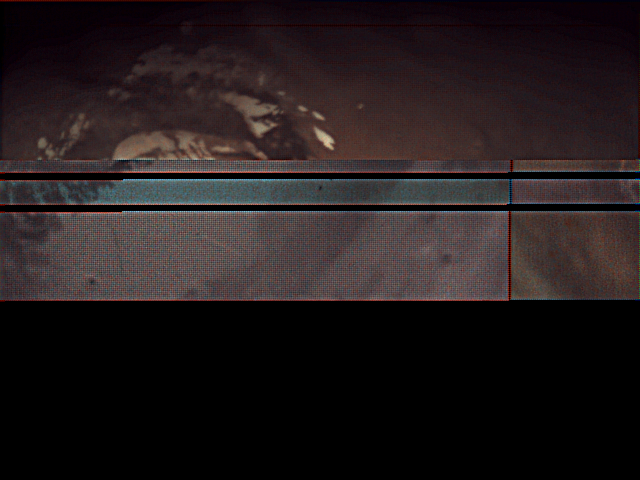 At that time, Cebreros was experiencing severe, heavy rain which caused problems with the reception of the Mars Express signal containing the VMC images - just as you may have noticed degradation on your satellite television at home during a storm.